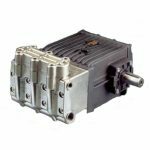 The HF Series Triplex high pressure plunger pump, is available four versions, it features a Symmetrical crankcase for easy left to right conversion Single P.T.O. shaft, HP seal + LH seal with cooling chamber in low pressure, long life Suction/Delivery in line valves with spherical profile Splash lubrication. The patent pending pump body features die-cast, aluminium with nickel-treated stainless steel head, Conical shaft bearings, Aluminium alloy connecting rods, Forged steel crankshaft Crankshaft sealings in viton Guide pistons in surface-treated cast iron Full ceramic plungers Stainless steel valves.